Let's just get to it! As an only parent this is the first question people ask me. My answer always has been, "I don't know. I just do." That's generally my default answer for life. Faced with a difficult task? Just do it. Faced with something that's hard to deal with emotionally? Push it away. Deal with it later when it has become small and insignificant. Faced with a difficult decision? – Do what is right. Or better yet, break it down into smaller, easier decisions. It was pointed out to me that from an outsider's perspective it seems like I just don't think about it. I just do it. And I manage to do it with a smile on my face and a warmth in my heart. A genuine super mom. I would have dismissed this comment entirely if it did not come from someone I hold a lot of respect for. Someone who knows enough of my story not to be an outsider, but not someone I have opened up to and shared my personal thoughts and feelings. She sees how I treat my children. She sees how I treat friends, she sees how I treat strangers. She says I have grace inside and out. I always thought that was my hard candy shell. That wall I put up so that no one can get in and I won't get out. Truthfully, I didn’t mean to end up here. If you had asked me 10 years ago where I would be today, I would have told you I would be living in a tiny loft in New York City trying to make it as a writer. Instead, I'm still living in Oklahoma and am a mother to two amazing boys. And I'm still a writer. My dream didn't change, my destination did. I'm still publishing poems. I'm still writing, mostly for my blog, Dishwater Dreams. But I'm also taking kids to karate lessons and birthday parties, and trying to make sure I go to the gym three times a week. I’m maintaining a YouTube channel, keeping two cats alive (barely) and trying to keep our apartment clean. I volunteer at church and try to attend all school activities I can. I realize that to the outside observer, I must seem like a total scatter-brain. Or a workaholic that never sleeps. Or a neurotic genius. I'm hoping the latter. The thing is, I'm not scatterbrained or a workaholic at all. I'm a dreamer. I believe that just about anything is possible, but before you can achieve it, you have to dream it. You have to start the journey. You have to work hard at it. You have to just do it. The thing with having big dreams is that your destination is a moving target. 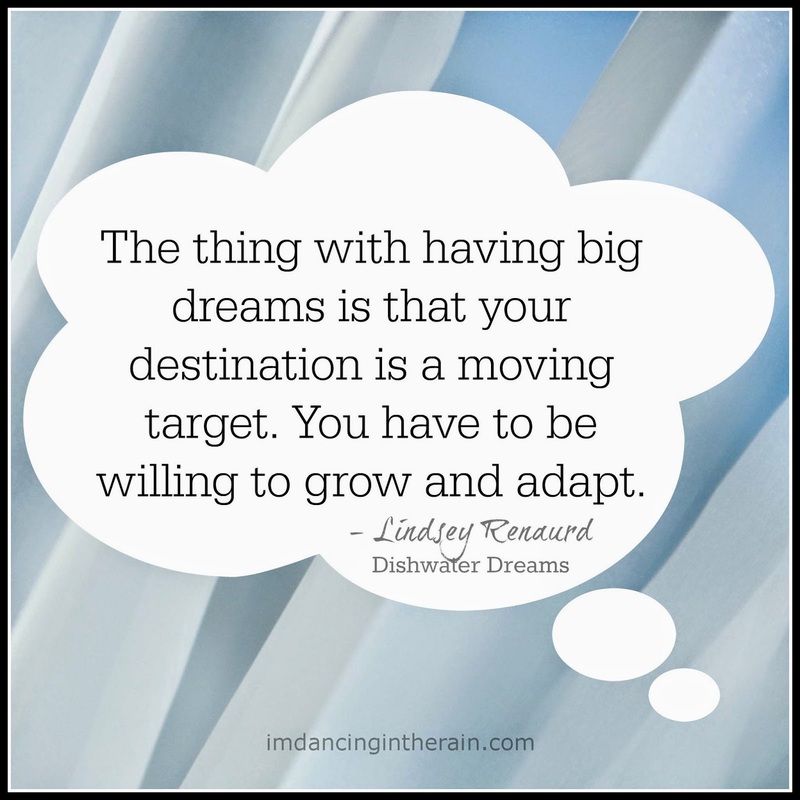 You have to be willing to grow and adapt. My pastor says that your dreams reflect your idea of God. And my dreams are huge. Not just for me, but for my children. And I know that despite it all, I’m doing something right. My oldest son is almost 9. At our last parent-teacher conference, she told me that someday he will leave his mark on this world and she can’t wait to see what that will be. My youngest son’s teacher goes on and on about how sweet he is and how much she just loves him to pieces. The truth is that I don’t get it all done. It’s not possible for one person to do everything and be everything. But with Grace, supportive parents, and two sons who have accepted that it’s ok that mom isn’t perfect, I will enjoy every step of my life’s journey. "I could never be diabetic or on dialysis because of the needles." "It must be so hard." "We don't know how we do it either. We just do." "You would do whatever you had to do to stay alive." "Yes, it's hard....but not all the time." You can't know what something is like or how you would handle it until it becomes your reality. If Mark and I can handle our stuff, and Lindsey can handle hers, so can you. Know what else you can do?